Having a cup of hot ginger tea at lunchtime has been a part of my routine for a few months now. Not only do I enjoy the taste but it always soothes my stomach and makes me feel relaxed and comfortable. When I researched the health benefits of ginger, I found evidence that ginger can cure nausea, headaches, migraines, stomach congestion, flu… many different ailments! It sounds like a panacea! I don’t know if it can sure all those things, all I know is that it always makes me feel good. I’ve been developing my own variation on traditional Korean saenggangcha so I decided to share it with you. This might be the simplest recipe on my website! It calls for very few ingredients: ginger and honey. That’s all you need! Don’t forget to float several pine nuts on the tea. Enjoy my hot tea, pulp and pine nuts! And just in case you don’t like pulp, I’m posting the traditional saenggangcha recipe, too. Peel a little more than 1 cup’s worth of fresh ginger. Wash and drain thoroughly. Puree the ginger with either a grater or food processor. Put 1 cup of the pureed ginger into a bowl. Add 1 cup of honey and mix well. 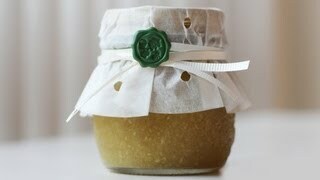 Transfer to a glass jar and store it in the fridge as you use it. To serve, mix 2-3 tbs of the mixture into a teacup of boiling water. Garnish with several pine nuts on top. Mix 3 tbs of the mixture into a large glass of cold water. 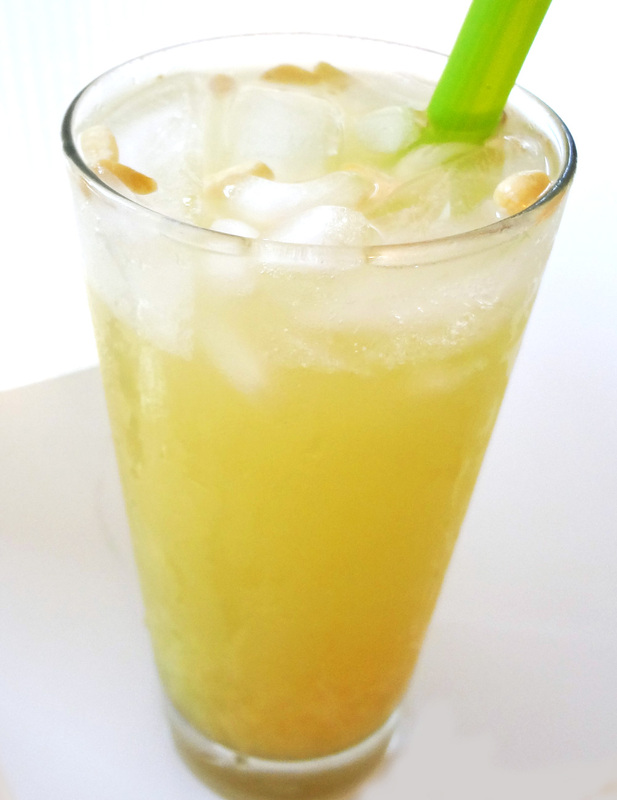 Add some ice cubes and garnish with several pine nuts on top. Thinly slice 1 cup of peeled ginger. Mix with 1 cup of honey or sugar. To serve, boil 3 tbs of the mixture and 1½ cups of water in a ceramic or Pyrex kettle for about 10 minutes. Pour only the tea into a cup and leave the ginger slices in the kettle. Garnish with several pine nuts on top. Enjoy the traditional hot tea! Posted on Saturday, July 7th, 2012 at 12:42 pm. Last updated on October 5, 2014. Posted December 13th, 2018 at 7:27 am | Log in to reply. Posted May 5th, 2018 at 9:00 am | Log in to reply. Posted February 5th, 2018 at 7:24 pm | Log in to reply. I followed your instructions, et voila! I made my own Saenggangcha using your recipe! Thank you very much! Posted February 17th, 2018 at 1:46 pm | Log in to reply. Wow it really looks gorgeous! Posted January 20th, 2018 at 4:07 pm | Log in to reply. Posted July 5th, 2017 at 2:09 pm | Log in to reply. Thank you for the perfect gift idea for Christmas, I’m always looking to making my Christmas gifts less expensive (I’m on a very limited budget each month) and this will make perfect presents for the adults in my family without having to spend a huge amount of money! This recipe was originally posted on July 7, 2012 at 12:42 pm by Maangchi. It was last updated on October 5, 2014. The video was watched 476,046 times on YouTube & has 8,853 likes!